Amidst the constant battle between Google’s Nexus 7, Amazon’s Kindle Fire(s) and Apple’s iPad mini, Vodafone on 16th of this month, launched a new Lenovo-made 7-inch Android tablet that will compete with Google, Amazon and Apple. The Vodafone Smart Tab 2 is 192mm tall, 122mm wide and 11.5mm thick. It weighs 400 grams. It sports a 7-inch WSVGA display with a pixel resolution of 1024 x 600. Under the hood, it is powered by a 1 Ghz Processor and it will feature the Android 4.0 Ice Cream Sandwich OS. It is equipped with a 2 MP Rear Camera and a 0.3 MP front-facing camera, along with 4GB of user memory, expandable up to 32GB via an SD Card slot. Users can enjoy WiFi and cellular 3G connectivity, as well as access more than 700,000 apps and services from the Google Play Store. The Vodafone Smart Tab 2 is available for £29 on 24-month price plans from £20 per month, including 2GB of mobile internet and 1GB of WiFi. It can be bought for £149 on pay-as-you-go. An optional fold-able hard cover is available for £25 to protect the tablet while on the go. Let us see how does it go for the Smart Tab 2. 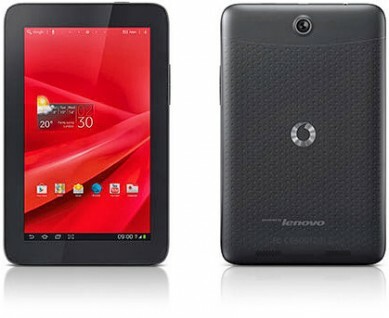 0 Respones to "Vodafone unveils the SMART TAB 2 alongwith Lenovo"